Home Hardware Stores Limited is Canada's largest independent home improvement retailer. The company is owned by close to 1,100 independent small business operators from every corner of Canada, who operate under one of four banners: Home Hardware, Home Hardware Building Centre, Home Building Centre and Home Furniture. Ranging from lumber, tools, paint, plumbing and electrical supplies, an extensive selection of building materials are available along with housewares, sporting goods, automotive products and lawn supplies…even furniture. Visit http://www.homehardware.ca/StoreLocator to find the Home Hardware nearest you. 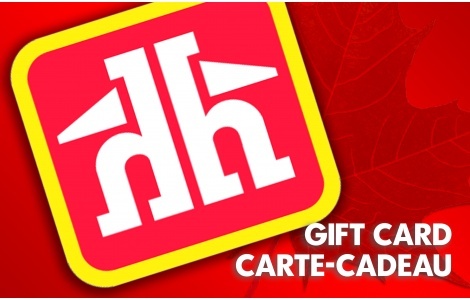 To order Home Hardware gift cards click the link below! Issuance or use of card constitutes acceptance of the following terms: If lost, stolen, or destroyed, card cannot be replaced without original receipt. Card cannot be redeemed for cash, unless required by law, or applied to any Home Credit Card or Home credit account(s). Standard return policy applies to goods purchased. No expiry date or fees. No value until activated.